Firm breathable and supportive commercial grade mesh sling designed not to hold water. 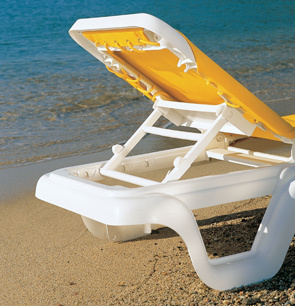 Adjustable five position back lays totally flat for tanning and upright for reading. This outdoor chaise lounge is naturally impervious to salt air and most stains. Solid one piece molded frames available in white, teakwood, bronze mist or pewter gray. 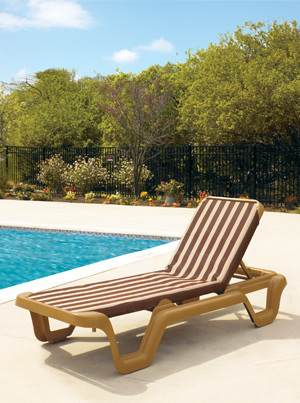 These pool and beach sling chaise lounge chairs are a family favorite! It's easy to get in and out the Marina. An inviting place for conversation. Easy to powerwash and clean. Easy to stack and store. 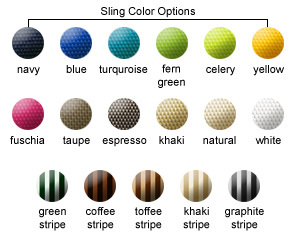 Sanitized®, colorfast, and mildew resistant mesh sling fabric always stays cool in the hot sun.